Loving Sai Ram and greetings from Prashanti Nilayam. 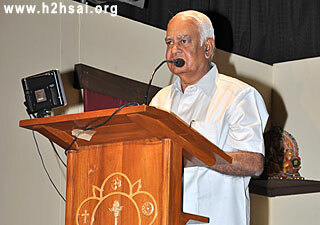 As most readers would be aware, Swami made a brief visit to Delhi and Shimla during April 2010. 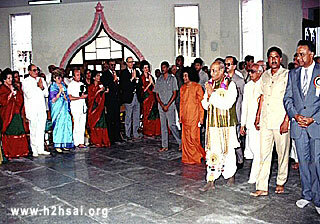 I was one of those fortunate to be blessed to be a part of Swami’s party, and sometime before the visit, I was alerted that I might have to speak in a Public Meeting, at which would be present largely non-devotees, including possibly many of the who-is-who of the Capital City. As such, so I was told, I should, in my talk not only give a thumb nail sketch of Swami but also of the incredible projects He has done over the years. Thirty minutes was all that I would have, and time budgeting would be very strict, I was warned! So I worked hard and came up with a talk mixed with appropriate visuals and all that, so that the impact would be as high as possible. Came finally the day when I actually had to deliver the talk. It was Sunday, 11th April, 2010. 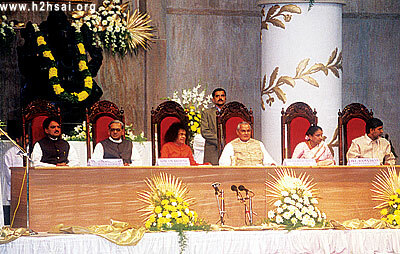 The venue was the Mavlankar Auditorium, adjacent to the Parliament Building. By the way, the auditorium was named after Mr. G. V. Mavlankar, the first person to serve as the Speaker of the Indian Parliament, after Independence [in August 1947]. I was all keyed up to do my bit, but the program as scheduled was different from what I had earlier been informed it would be. 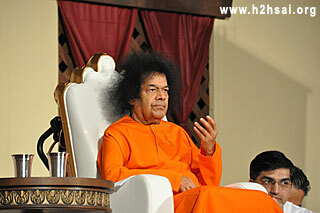 Such surprises are common in Swami’s events, which is why He often says: Love My Uncertainty! Anyway, my 30 minutes was slashed down to 12 minutes, although I managed to grab a few more and make it 15, which was not too serious a “foul”! Even so, by Swami’s Grace, my talk went well. However, sometime later, many people who were familiar with what I had actually prepared for the occasion said to me, “Why don’t you consider publishing the talk as you had prepared in H2H? There are so many interesting bits and pieces you had gathered, it would sure be interesting for the global community of devotees to know about.” I thought that was a fair suggestion, and hence am presenting below the substantive part of my talk as I was supposed to deliver, with of course some minor cosmetic changes. The topic I have chosen to speak on today is entitled “THE IMPORTANCE OF BEING COMPASSIONATE”. As many of you would immediately recognise, the title is obviously an adoption of the name of a famous book. I have chosen this title because it has something to do with my own personal life, which has been a journey from Dr. Homi Bhabha to Bhagavan Sri Sathya Sai Baba, that is to say, from Science to Spirituality. In my early days, I often heard Jawaharlal Nehru declare that it is Science and Technology alone that would solve India’s problem of poverty. Back then, I intensely shared this belief. It was only much later I realised that something more than just Science & Technology was required to solve human problems. The picture below highlights that missing link. The gentleman whom you see in the picture is Prof. Victor Weisskopf, a brilliant physicist. An Austrian by birth, he fled to America to escape Hitler, and worked on the atom bomb project during World War II; that is why you see a picture of Robert Oppenheimer hanging there on the wall. For those of you who might not know, Oppenheimer was himself a brilliant physicist, often described as the father of the atom bomb, a description that he detested. After the war, Weisskopf turned pacifist. The statement you see in the picture is taken from a speech he delivered to the American Association for the Advancement of Science. I think the statement speaks for itself. 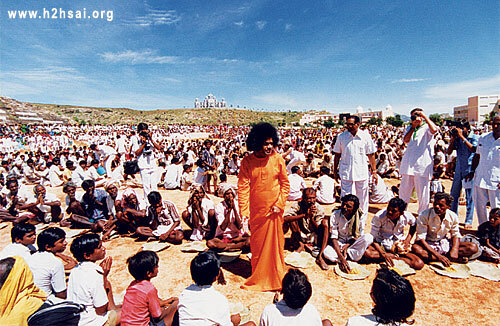 I did not realise the importance of blending knowledge with compassion until after retirement in October 1992, and settled down in Puttaparthi to teach in an honorary capacity in the Sri Sathya Sai University, established by Bhagavan Baba in 1981. That was when I learnt how Baba was already using this amazing mix of knowledge and compassion, to accomplish extra-ordinary goals. I also learnt from Bhagavan Baba that anyone can in principle do this, by tapping into the power of the Spirit that is present in all of us without exception. That was when I learnt how Baba was already using this amazing mix of knowledge and compassion, to accomplish extra-ordinary goals. I also learnt from Bhagavan Baba that anyone can in principle do this, by tapping into the power of the Spirit that is present in all of us without exception. While in many this Spirit makes its presence felt through achievements in exploration, adventure, arts, music, science, and so forth, its highest capabilities manifest when one overcomes ego. That is when the Spirit blossoms fully, spreading the fragrance of Pure Love, Limitless Compassion, and Unbounded Sacrifice. I should mention here that this Spirit that I am referring to is nothing other than what our ancients referred to as the Atma. While in many this Spirit makes its presence felt through achievements in exploration, adventure, arts, music, science, and so forth, its highest capabilities manifest when one overcomes ego. That is when the Spirit blossoms fully, spreading the fragrance of Pure Love, Limitless Compassion, and Unbounded Sacrifice. The rest of this talk would revolve around how Bhagavan Baba has actually demonstrated the tremendous good that can be done to humanity, by combining modern knowledge with compassion. Specifically, I shall first say something about the Drinking Water Projects done by Baba, in particular, the project He has done for bringing drinking water to the Metro city, Chennai. Following that, I shall make a brief reference to Baba’s Super Speciality Hospitals. This would then bring me to a key segment, wherein I shall briefly discuss how exactly Baba achieved what he has. Following that, I shall wrap up, with a few concluding observations. That, roughly, is the outline of what is to follow. Bhagavan Baba’s involvement with Drinking Water Projects started in 1995, when He launched a massive project to bring safe drinking water to a large chunk of Anantapur District, always known for its perennial drinking water problem. That project which cost about 300 crores was completed in record time, after which Baba went on to do many other such projects. The two pictures alongside would show you a short summary of these projects. The first table lists the various Drinking Water Projects that Swami has done to date, while the second shows a map of Andhra Pradesh and the Districts where Swami has executed Drinking Water Projects. I now wish to say something about the Chennai Drinking Water Project because it is both unique and extra-ordinary in many ways. As a student I lived between the years 1946 to 1954 in Madras, later to be renamed Chennai. Even in those days, drinking water was a big problem, and I used to hear it being mentioned that Madras would get salvation only if the waters of River Krishna were brought to the city. The picture below shows the Krishna River on the one hand and the location of Madras city on the other. That should give you some idea of the distance over which the Krishna waters would have to be transported, if it were to quench the thirst of that metro. Later, I shall describe the details. To proceed with the story, many years passed before some agreement could be reached between the States through which River Krishna flowed, namely, Maharashtra, Karnataka, and Andhra. 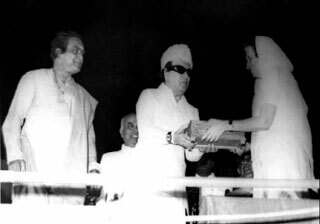 In 1984, things began to actually move, thanks to an agreement between Mr. N. T. Rama Rao and Mr. M. G. Ramachandran, both ex-film stars, but at that time the Chief Ministers of Andhra and Tamil Nadu respectively. In translation that meant that Tamil Nadu would have to foot the bill for the canal! Two pictures taken at the time of the inauguration of the above project are shown below. It is time now to show my first video clip. That is available below, and it shows how it was proposed to bring Krishna water to Chennai. The project commenced in 1984, was completed in September 1996, Tamil Nadu’s contribution to the expenditure on the project being around 550 crores. Here is a short video clip showing the pillar marking the inauguration of the Kandaleru-Poondi canal as the scheme was called. With the canal ready, the citizens of Chennai thought their drinking water problems were over. They were not. 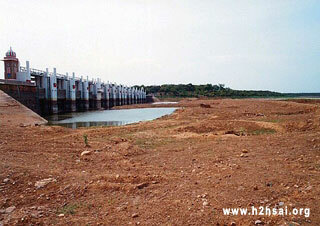 The canal was supposed to deliver every year, 12 TMC of Krishna water to the Poondi reservoir in Chennai. One TMC is one thousand million cubic feet. It is a term used in irrigation. For four years in a row, the amount delivered was less than 3 TMC, meaning that supply was at best only 25 % of the promise. Only once did the supply touch about 6.5 TMC. 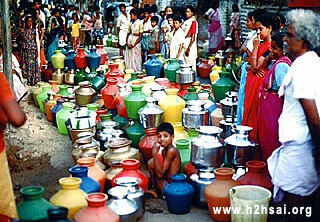 The reason why so little of Krishna water reached Chennai can be seen in the next video clip. As you just saw, the Kandaleru-Poondi Canal was, at its best, one long ditch. Meanwhile, Chennai suffered repeated failure of the NE Monsoon. For the people of Chennai, it was thus a double whammy – no water from the Krishna River and no water from the Monsoon either. You will now see some pictures of how bad the situation was then. I think the pictures of the dry lakes and people anxiously waiting for the Municipal Water Truck speak for themselves. To meet the acute water shortage, the Metro authorities had to resort to tanker service. You will now see a short clip relating to all this. The tanker service provided water. But it was free, although it meant a lot of waiting. As for the private tanker service, it was costly, and quite unreliable; what made it even worse was that the water supplied was polluted. You will now see a short clip relating to the waiting and the anxiety that it caused. The next video clip would highlight all the other problems which the one you just saw, did not. By 2002, the situation in the city was becoming desperate, and no one really knew what to do. That was when something totally unexpected happened. 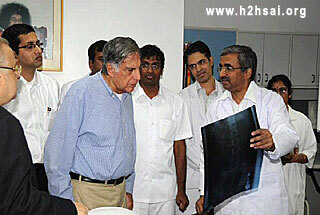 The day was January 19, 2002, and it marked the first anniversary of Baba’s second Super Speciality Hospital. Exactly one year earlier, the then Prime Minister Mr. Atal Bihari Vajpayee had inaugurated this hospital – I shall later make some remarks about Baba’s Hospital projects. But to get on with the story, on the occasion of the first anniversary of the Bangalore Hospital, there was a function and also a Health Meet to mark the occasion. Baba gave a Discourse on that day, and in the course of His talk, He made a stunning announcement. The next video clip would enlighten you further. So there it is. Nobody from Chennai had asked Baba to solve their problem, but Baba made the offer on His own. That is typical of Him. Once Baba makes a decision, He moves really fast. 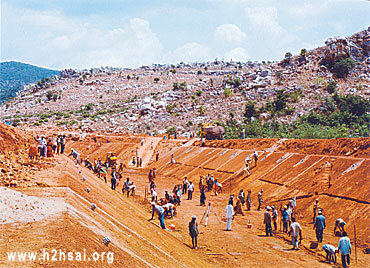 It was clear that entire Kandaleru-Poondi canal had to be rebuilt and done so using modern technology. And that precisely is what Baba ordered the Sri Sathya Sai Central Trust to do. Active work commenced sometime around late 2002. The next video clip would give you some idea how the canal was rejuvenated. The reconstruction of the broken down and totally dysfunctional canal was a non-trivial job. I do not have time to go into the details but there are two facts that I need to bring specially to your attention. The first is that in some sections, the canal had to negotiate mountainous regions and this was far from easy, as the pictures below show. 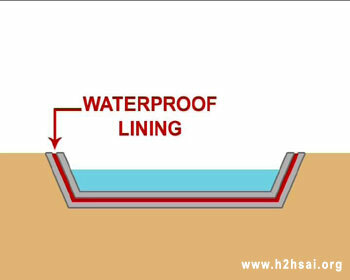 I must next mention that for the first time in India, a special lining was introduced during construction, to prevent loss of water due to seepage. The picture above gives a schema of this new approach. In passing it might be mentioned that seepage loss from canals even if lined with concrete can be quite substantial. I believe experience with the Indira Gandhi Canal in Rajasthan shows that. 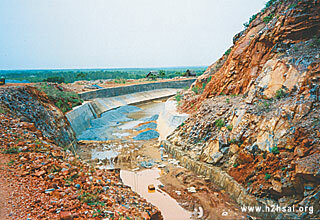 The Indira Gandhi Canal is one of the biggest canal projects in India. It starts from the Harike Barrage below the confluence of the Rivers Sutlej and Beas in Punjab, travels south-southwest through Haryana and terminates near Jaisalmer in Rajastan, covering a distance of 650 kms. 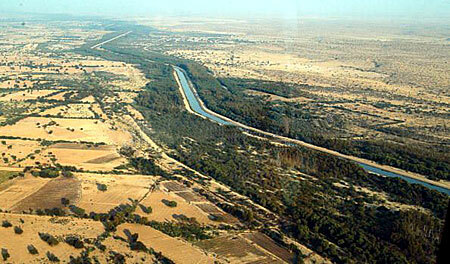 The objective of building this canal was to ‘de-desertify’ and transform the northern-western Thar desert of Rajasthan into an agriculturally productive area. The project started in 1958 and it took 20 long years to complete the entire stretch of the canal with cement mortar lining. It did serve to convert many hectares of the desert into cultivable land and also provided drinking water to many dry and drought-prone districts of Rajasthan. However, soon there were many problems; the chief among them being water seepage from the canal. Substantial leakages every year coupled with excessive irrigation resulted in the widespread problem of water-logging and high soil salinity in large areas (about 24%) along the canal; and this has not only adversely affected agriculture but also has led to submergence of land, creation of new waste lands, and other related environmental degradation issues. “Water Woes Loom as Indira Gandhi Canal Dries Up” said the headline of a leading national newspaper on February 11, 2010. The water supply from the canal has been reduced to half and is said to go down further in the coming days, the article reported. Reacting to agitations from farmers and others which has in fact been going on decades, the Central Government in April 2010 sanctioned Rs. 1,410 crores to renovate the canal which includes repairing the main canal as well as its lined distribution system to prevent as much leakage of water as possible. To get on with my narration, for the record I should point out that the total length of the canal from the Kandaleru Reservoir in Andhra to the Poondi Reservoir in Chennai is about 150 km. 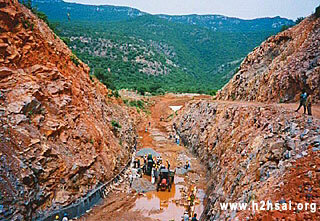 While the major portion of the canal runs through Andhra Pradesh, the last stretch of about 25 km is in Tamil Nadu. Baba has renovated both segments. The next clip gives you some glimpses of the canal, after being completely rebuilt. 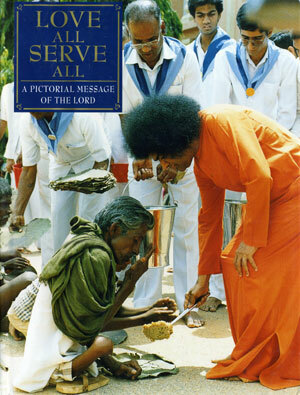 By November 2004, everything was ready, and water was released on November 23, 2004 [Swami’s 79th Birthday], in the new and totally revamped canal to quench the thirst of the suffering masses in Chennai. The water that was released took only four days to reach Poondi, compared to the 12 or so days it needed earlier – that is the difference good lining makes, apart from saving seepage losses. Kindly note that the entire renovation was done in about two years flat. 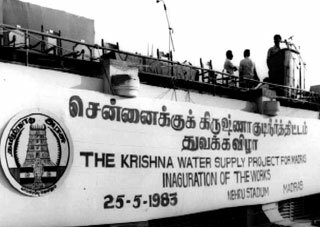 You will now see a video of the first water release and the first arrival of Krishna water in Chennai, via the totally refurbished canal. Here is a small reminder of how bad things were earlier and how they then changed. And now, as you can see from the picture below, the lake is full. In fact, it has been almost full for the last several years. Let me now wind up this great water story with a couple of aerial shots of Chennai’s lifeline. There are two points I would like to make before I turn to the next topic. Firstly, to my knowledge this is the largest private initiative project anywhere in the world, for brining drinking water to a huge metro city like Chennai. Secondly, it is worth noting that the population of Chennai is comparable to that of entire countries like Austria and Sweden. Allow me now to say a few words about Baba’s two Super Speciality Hospitals, since that would illustrate another aspect of Baba’s boundless compassion. 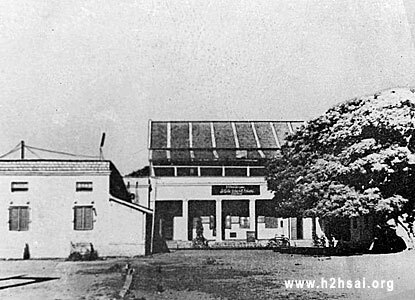 Let me begin by showing you a few slides that introduce you to the two hospitals. That then is a brief introduction to Baba’s two amazing Super Speciality Hospitals. I can reel out any amount of statistics about what a great job these Hospitals have been doing, but I shall not. Instead, I shall give just one example of how these hospitals serve those who cannot go anywhere else. My story concerns one Jehangir Molla, a resident of Kolkota. Jehangir worked as a mason, and one morning in August 2007, while doing some repairs in a school, he fell down on the road from a height of about 25 feet, when the bamboo scaffolding on which he was standing gave way and broke. 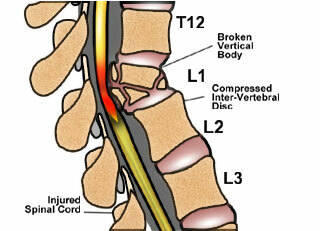 His vertebra was fractured and he became paralysed below the waist. 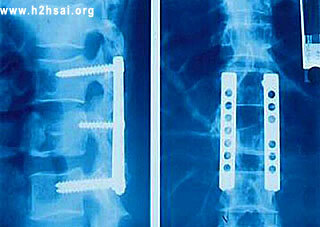 However, his back experienced excruciating pain. For one month, his family took him all over Kolkota, looking for some hospital that would treat him. Most hospitals simply refused to look at him, saying his case was too risky. One hospital was willing to consider surgery but wanted 6 lakhs, just for the procedure; all the rest like stay, medicines, etc., were extra. Obviously, Jehangir could not afford that. That was when he heard about Baba’s Hospital and, with the help of his brother Zakir Hussain Molla, made the long train journey to Puttaparthi on a stretcher. In early September, he was examined but since the case was complicated, elaborate preparation was needed. Finally he was admitted after a few days, and then operated upon. Here are some pictures relating to this case. To get on with the story, Jehangir’s surgery was successful, and that itself was a miracle I am told. Jehangir stayed for about two weeks in the hospital and was discharged. But the story does not end there. Jehangir was asked to stay back for physiotherapy which went on for five months, yes five months. And how did that work out? The next video clip would answer that! Now, isn’t that amazing – I mean a poor man with a broken spine not only being relieved of life-long paralysis but also able to get his normal life back? All that happened because someone decided a long time ago, that worldly knowledge alone serves no real purpose but when combined with compassion can do so much good to so many people. Ladies and gentlemen, please note that this does not and cannot happen in the richest country in the world. I can say this with complete confidence, having closely followed the recent health care debate there. What might not happen in the richest country CAN and DOES happen here, for is this not the land of the Buddha, the embodiment of Compassion? Bhagavan Baba has repeatedly shown that thousands of years later, compassion is very much alive in this country and quite vibrant too. 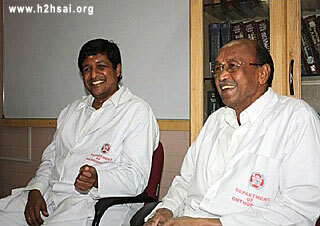 By the way, Dr. Kailash Rao who operated on Jehangir came to the Puttaparthi Super Speciality Hospital some years ago, and works full time, in an entirely honorary capacity, as do many others, like for example Dr. Safaya who heads the Puttaparthi Hospital, and Dr. Hegde the nationally and internationally renowned neuro-surgeon, who heads the Bangalore Hospital. It is not out of place to mention that before he came to serve Baba, Dr. Safaya spent many years here as an head of the All India Institute of Medical Sciences. I will now show you a video clip featuring one of the doctors of the Puttaparthi Hospital, Dr. Iyer by name, recalling the story of a patient he had handled. Dr. Iyer has been with the Puttaparthi Hospital since around 1992. Ladies and gentlemen, missions of compassion are done silently. The world may not hear about them, but for the beneficiaries, life becomes very different when touched by Pure Love. It is time now to say a few words about the driving force behind the projects I have been giving glimpses of, namely, Bhagavan Sri Sathya Sai Baba. Baba was born in 1926, in a tiny hamlet called Puttaparthi, in Anantapur District of what was then the Madras Presidency. Located in an arid region that was as backward as one can imagine, the hamlet had at that time a population of about a couple of hundred. 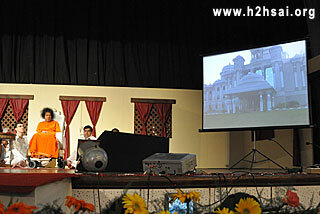 The picture on the left gives a glimpse of the house in which Baba was born. Baba continues to live in Puttaparthi, but of course not in this house. That has been pulled down, as a part of the general transformation of the village. Getting back to the main story, at birth Baba’s parents gave him the name Sathyanarayana Raju; Raju being the family name. Since there was no school in Puttaparthi, young Sathya had to go elsewhere to study. Thus it was that around the late thirties, he went with His elder brother to a small town called Uravakonda, to study in a school where His elder brother was a teacher. 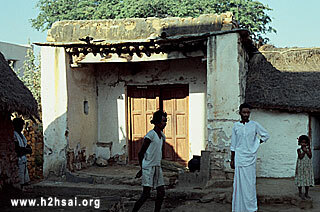 This is a picture of the school in Uravakonda where Baba studied. This picture was taken long after he left it, and when Baba was there, the school facilities were far more rudimentary. On October 29, 1940, young Sathya suddenly announced to his utterly shocked elder brother, that He was quitting home and school. Why? Because He felt an inner calling to serve humanity. So saying, Sathya went to a neighbouring garden, and began to lead people gathered there in singing Bhajans. Few understood what Sathya was trying to say, and fewer still believed it. But India being India, people responded, as always, very positively to spiritual vibrations. One must put all this in the context of global history. October 1940. 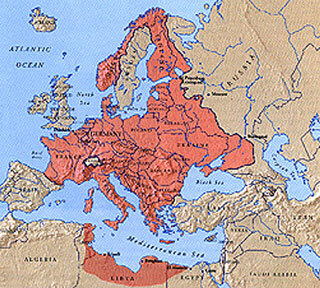 Hitler had overrun most of Western Europe and was threatening to invade England. 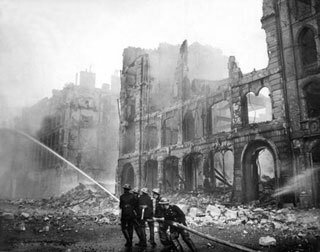 London was being bombed regularly. 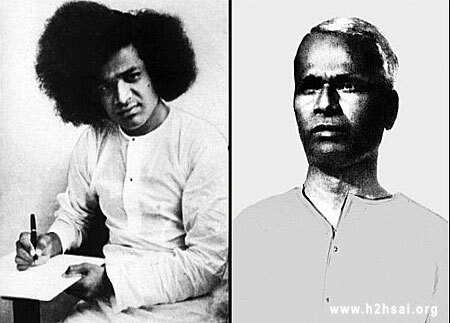 Having made that momentous decision, Sathya, now known as Sathya Sai Baba, returned to His native village to quietly set up a base for His future activities. At that time, He was mostly busy in helping people become spiritual. Elder brother Seshama Raju, felt utterly dismayed. In early 1947, he wrote a letter to young Baba, conveying his disappointment about lost opportunities. Baba responded with a letter that spelt out clearly what His aims and objectives were. These are pictures of Baba’s elder brother and Baba Himself, roughly around that time. 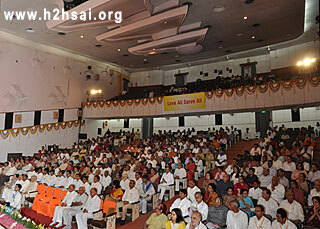 1.To foster all mankind, and ensure for all people lives full of Ananda. 2. To lead all who stray away from the straight path, again into goodness and save them. 3. To remove the suffering of the poor and grant them what they lack. The Chennai water project and the glimpses that I offered of the Super Speciality Hospitals of Baba, are tiny samples of what Baba has quietly been doing for decades. People ask: HOW DOES BABA MANAGE ALL THIS? Thus it is that throughout the year, eminent doctors from all over the world come to Baba’s Hospitals to spend time there in service. Thus it is that every single Vice Chancellor of the Sri Sathya Sai University, from the very first one, namely Dr. V. K. Gokak, the well known writer, to the current one, the eighth one I might add, namely, Prof. Viswanath Pandit, formerly of the Delhi School of Economics, has served in an entirely honorary capacity. None of the Vice Chancellors has taken even one paisa as salary. I should not forget to mention the names of Mr. A. Ramakrishna, formerly of L & T and Mr. R. Kondal Rao, formerly Chief Engineer Andhra Pradesh who gave themselves wholly to executing so many of Baba’s projects, including the various drinking water projects that I mentioned. Pure Love is the other side of Compassion. If you unleash the Power of Pure Love latent in you, the impossible becomes possible. That, ladies and gentlemen, is the power, the magnetism, and the magic of Pure Love and Selfless Service. I do not have the time to tell you the full story of the wonders that Baba’s Selfless Love has performed, but I must say that I have seen with my own eyes for close to two decades, how the blend of worldly knowledge and unbounded compassion can work, can do wonders, and above all, remove a lot of pain and suffering! Having watched Bhagavan Baba from close quarters for nearly two decades, I can say with much confidence that if properly tapped, Atmic energy can indeed solve many of this country’s problems. In making this statement, I would like to assure all present here that tapping the latent power of the Atma would not cost the exchequer even one paisa! Well, how exactly does one tap this energy resource? The answer is given in the next slide. There it is! LOVE ALL, SERVE ALL! That is the magic mantra! It does not call for huge budgets, nor blood, toil, sweat, and tears. All it calls for is Selfless Love, lots of Compassion, and a dash of Dedicated Service. Give it a try! You might even like it! It actually works you know, and that’s what Baba has been showing us for years and years. I think I have said all I wished to. Thank you for your patience! Given above is the text I had prepared to serve as reference while I gave my talk in Delhi. As I have mentioned in the beginning, what actually happened was something different! Remember, this talk was prepared as an address to an audience that was not supposed to know much about Swami. [Yes, there are plenty of such people in this world, including in India, especially in high places – their universe is different!] And that is why I was asked to say something so that they [these august members of the audience] realise that Sai Baba is not what they tend to believe based on a lot of ill-informed gossip and hearsay, but the very embodiment of compassion. Notice that I began with a quote from a leading scientist. That also was very deliberate. These days, many people tend to think – and I have seen plenty of serious discussions concerning this – that technology can solve all problems. That of course is utterly false. Most of the problems are created by the Mind. The Mind is very good at creating a mess but when it comes to solving problems, it does a horrible job. H2H has said a lot about that and there is no need to repeat all that now. What is more important is to stress that it is the Heart alone that can heal and solve problems, that the magical combination of Head and Heart is meaningful and that every major project of our Beloved Swami is a living proof of that. 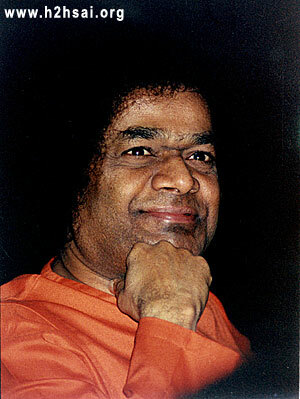 Devotees love to talk of the “leelas” of Swami by which they mean mostly miracles. 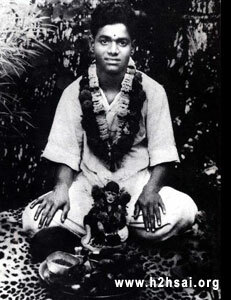 Yes, “leelas” ARE the signature of God [visiting cards as Swami refers to them]. However, even greater are His “Mahimas”, where the impossible is made to happen by the sheer power of Love and Compassion. People sometimes ask: “Why all these hospital projects? Swami can cure anybody with vibhuti? Why does He not do that?” It is astonishing that 85 years after His advent, there are people who ask such questions. 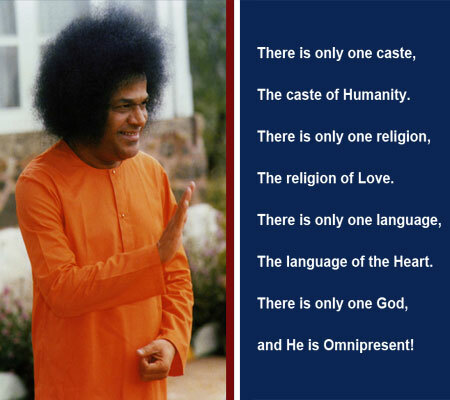 Swami does all this so that we start emulating Him, making our lives become His Message. It is so that His Message is better understood, that I ventured in my Delhi talk to mention not only about the projects, but also about some of the people behind those projects. This is a Golden Era when clay can become gold by coming into contact with Swami, not by merely touching His Feet, but by walking along the path He has tread! I requested H2H to give this manuscript some visibility so that at least a few of the finer aspects of Swami’s Missions are better known the world over. Dear Reader! If you like this article, do draw the attention of as many people as possible to it. Swami is MUCH more that He appears to be! The more people know about that, the better it would be for society. Thanks in anticipation. Jai Sai Ram.